This is 365 Days of Astronomy. Today we bring you a new episode in our Space Scoop series. This show is produced in collaboration with Universe Awareness, a program that strives to inspire every child with our wonderful cosmos. It’s well known that the planets, moons, asteroids and other objects in our Solar System orbit the Sun in a more-or-less perfectly flat rotating disc, like a spinning CD. But is this true for other Solar Systems in our Universe? By July 25th 2014, 1,811 planets had been found orbiting distant stars, and the majority of these planets do orbit their stars in roughly disc-shaped orbits. But there are exceptions. Some planets have been found orbiting their parent stars along strange, tilted paths, not unlike our dwarf planet Pluto with it’s orbit tilted 17° to the ecliptic plane. And we are now a step closer to understanding these weird and wonky systems. Unlike our solitary Sun, most stars form in binary pairs — two stars that are in orbit around each other. Using the ALMA radio telescope in the Atacama Desert of Chile, astronomers have recently been observing two wildly crooked planet-forming gas discs around the young stars in a binary system called HK Tauri. They are in the constellation Taurus, just to the left or East of the Pleiades and almost due North of the brilliant red giant Aldebaran. 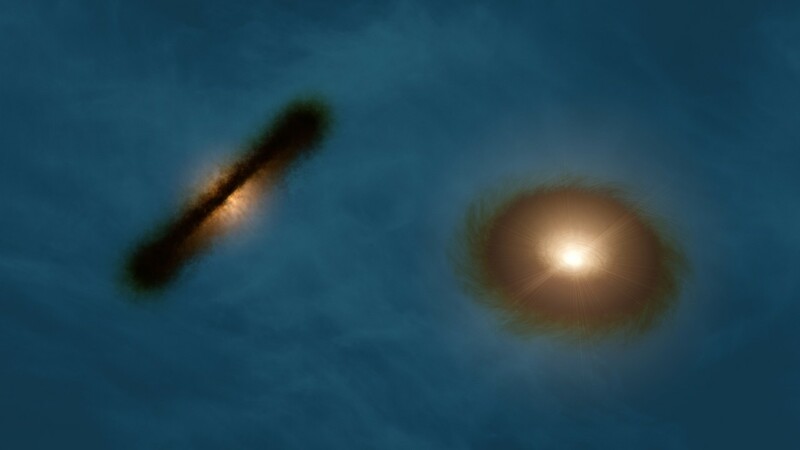 Two planet-forming discs (one around each star) are tilted almost at a right-angle to each other. 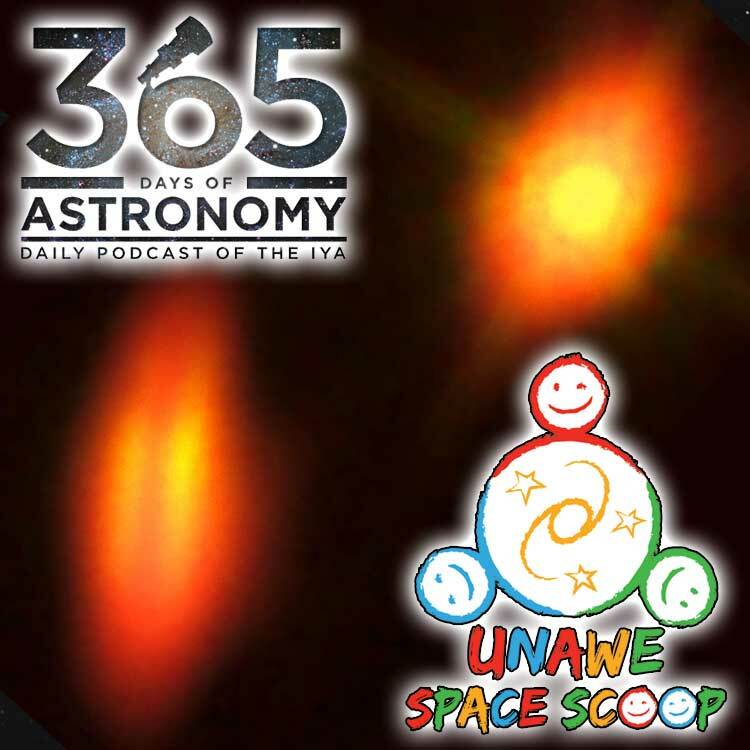 The picture in today’s album artwork is a mixture of visible and infrared light from the Hubble space telescope and ALMA’s radio imagery to show us what the system is like. These observations have provided us with the clearest picture ever of protoplanetary or planet-forming discs in a double star. So, why are these planet-forming discs so skewed? Because the two stars and their discs are not perfectly lined-up, the gravitational pull of one star pulls on the other’s disc, making it wobble. Any planets forming in one of these discs will also be disturbed by the other star’s gravity, causing its orbit to become tilted. Here’s a Cool Fact: It looks like each star in the HK Tauri system will eventually have it’s own planet (or maybe multiple planets!) But in our galaxy there are some planets that orbit around two stars. These are called ‘circumbinary planets’ and there have been 17 discovered so far. Thank you for listening to 365 Days of Astronomy!